The Prince of (Useful) Fools? But Prince’s connections to Trump and the Alt-Right hardly stop there. Prince is the brother of Education Secretary Betsy DeVos and the son of the late Edgar Prince and Elsa Prince Broekhuizen. Both parents have been members of the secretive Council for National Policy (CNP) and Elsa Prince Broekhuizen has been on its Board of Governors. Betsy DeVos’s husband, Richard DeVos, is a past CNP president. The membership of the CNP has included Steve Bannon, Kellyanne Conway, Dave Bossie (President of Citizens United until he joined the Trump Team) and others of the most extremist leaders of the American Right (go HERE for the Southern Poverty Law Center’s chilling analysis and for the 2014 CNP membership directory – the only one available). Brat, after coming to the notice of John Pudner, a childhood friend of Steve Bannon’s, received a great deal of help from Bannon, Breitbart, Dave Bossie, and other luminaries of the Alt-Right in his run against Eric Cantor – probably worth the equivalent of tens of thousands of dollars in advertising – and has since written for Breitbart and been a guest on Breitbart radio. Indeed, it was Brat’s victory against Eric Cantor that made Bannon, Sessions, and others on the Alt-Right see a path to the presidency paved with anti-immigration rhetoric. Brat, in fact, sought and received the endorsement of one of the most vicious anti-immigration groups in the country, ALIPAC, which made robot-calls for Brat during the primary against Cantor and bragged about their part in his victory. Brat has received contributions from five members of the billionaire DeVos family and from Richard Huizenga, another Michigander (like Brat, the Princes, and the DeVoses) and a member of the CNP. Brat took the lead in voicing support of DeVos for Secretary of Education. 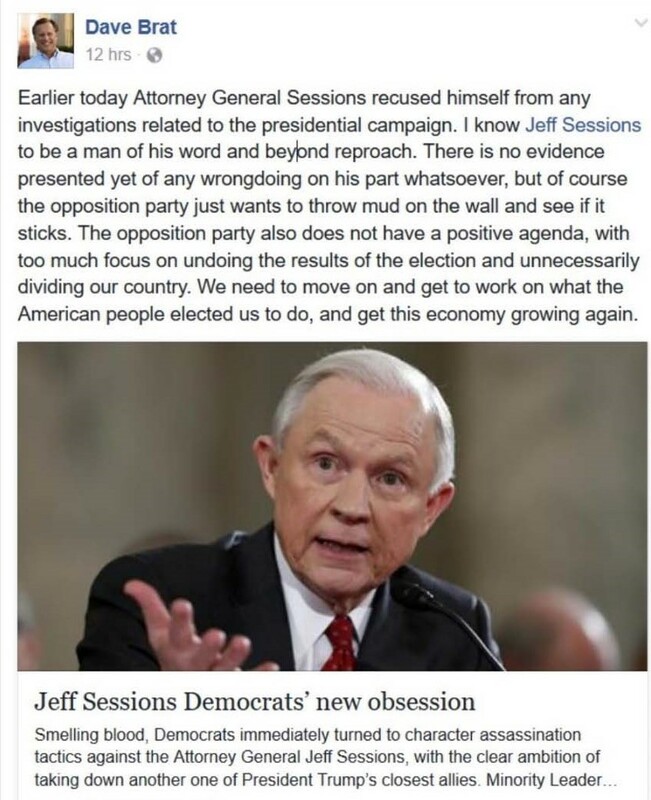 Brat is close friends with Jeff Sessions who spoke at a fundraiser for Brat in 2014 (where he likened Brat to Patrick Henry! ), co-authored a letter on immigration with Brat, and toured with Brat late in 2016 in a last-ditch (and failed!) effort to win Virginia for Trump. 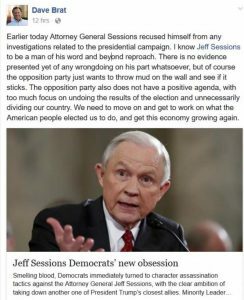 Though Brat leapt to Sessions’s defense the moment Sessions recused himself, he had disavowed knowing Sessions before his own arrival in Washington in 2015. Perhaps he’d got wind of something fishy and wished to create as much distance as he could. Brat consulted with Stephen Miller on his 2014 run against Eric Cantor. Miller, of course, is now Trump’s senior policy advisor, but at the time he was Jeff Sessions’s communications director. In that capacity, Miller was in constant contact with Breitbart staff, including Julia Hahn, who later served as Brat’s press secretary (this and much more is documented by Julia Ioffe here). The Trump campaign showed enormous favoritism to Brat when it sent Mike Pence to Brat’s headquarters three days before the election last year to bolster his campaign. To send such a valuable player at a time when every second was valuable shows a great deal of loyalty to Brat. Brat has himself briefly flirted with Russia-inspired smearing of Hillary Clinton, as this Tweet bears witness. Notice that Brat is citing Julian Assange and Russia Today, the Kremlin-run news outlet that has been publishing Assange regularly and that according to the New York Times, paid Michael Flynn $45,000 to attend a gala in Moscow (where he sat next to Putin) and give a speech. 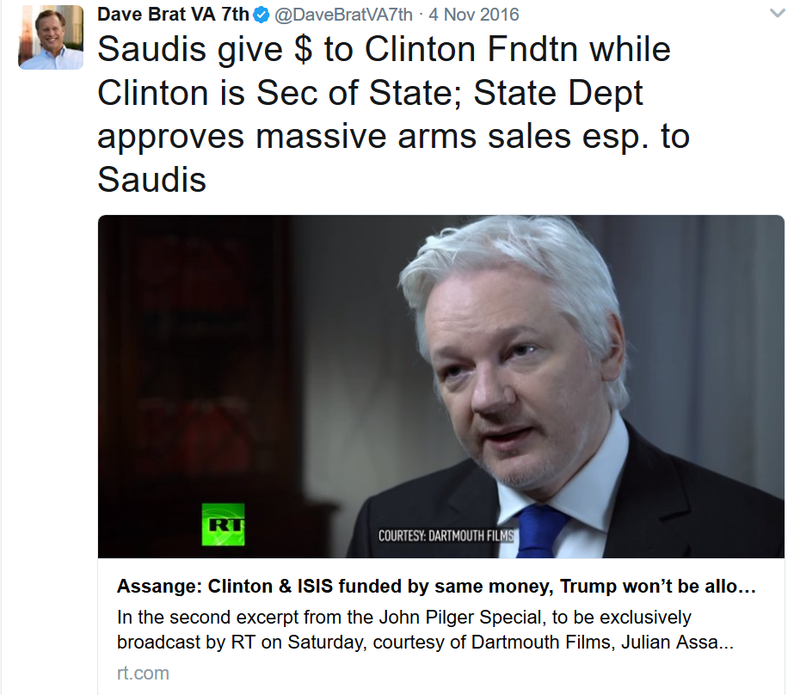 Note, too, that the Tweet is dated days before the election and expresses Brat’s criticism of a Saudi arms deal negotiated under Obama, though Brat has been silent on the $110 billion deal made last week by Trump. There can be little doubt that the investigation into Trump-Russia imbroglio will go on for a good long while and that we will continue to be inundated and intrigued. We have not yet learned, for instance, what the content of Jeff Sessions’s meetings with Kislyak were, and perhaps there were other meetings with other Russian officials, bankers, and entrepreneurs which have not even surfaced. We need to call our representatives to account. The line has been drawn; let’s see who has the moral courage to put country before party.